Ever since the founding of our nation, the voices of women were important in building our society. Like so many of their male counterparts, many important female Americans were not willing to play nice to make a difference. Anne Hutchinson braved Puritan aggression and a raging Indian war in New York in order to advance her beliefs. 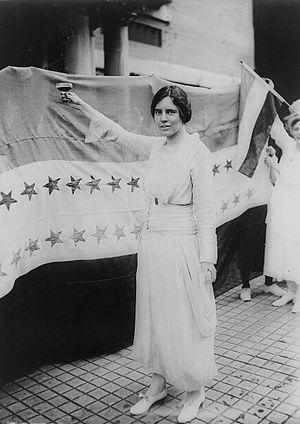 Susan B. Anthony, Elizabeth Cady Stanton and Alice Paul endured constant opposition, both nonviolent and otherwise, in their quest to gain voting rights for women. Harriet Tubman dodged very real dangers in leading enslaved Africans to freedom. March is Womens’ History Month, and teachers will be hungry for good books for their students to use about these important women. There are quite a few different books about many different women. 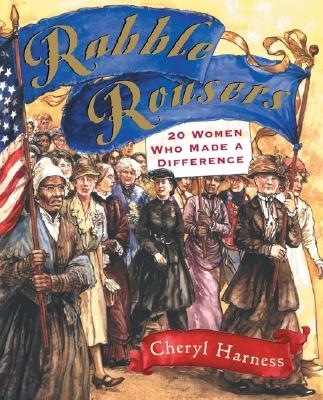 Yet if a student needs to do a biography, and hasn’t a clue about who (aside from the usual suspects mentioned earlier), then Rabble Rousers: 20 Women who Made a Difference by Cheryl Harness is a great start. Harness took 200 years of womens’ activism and created a lively, engaging primer on many of the important women who changed our world. 20 women are documented in 2-page illustrated biographies covered with sidebars, photos and artwork detailing the lives, worldview and important events that these women lived through. Many of the women documented here are well-known to students today. Susan B. Anthony, Sojourner Truth, and Eleanor Roosevelt sould be familiar. Yet there were others who may not be so well-known. Mary Edwards Walker, for example, was an abolitionist and nurse who spied for the Union during the Civil War, becoming the only female to ever receive the Medal of Honor. Frances Wright was an early 19th Century social reformer whose ideas about social issues made here at least a century ahead of her time. One selection, however, puzzles me. Ann Lee, the English mystic who founded the Shaker sect, or the United Society of Believers in Christ’s Second Appearing, is one of Harness’ revolutionary women. I’m not really sure that the founder of a sect that is almost extinct today really warrants such a coverage. In spite of this, Harness excels in this work in both her detail and her focus. Unlike other books on American women, she does not present a massive volume with hundreds of women in little detail. Instead, her main thrust is to include 20 women who made active efforts to create positive change in their society, and to present them to the fullest extent possible. Students who use the book in reports may only need one or two more sources to form a complete assignment. Furthermore, girls can really use Rabble Rousers as a source of inspiration and encouragement. By choosing women who led from the front, rather than behind, Harness is providing role models for women to become modern-day leaders. She even provides detailed bibliographies, places to visit and suggestions for community action in the spirit of her revolutionary subjects. Modern girls owe a debt to Cheryl Harness in providing such role models. As we begin Womens’ History Month, make sure Rabble Rousers is necessary reading in your classroom.